Omeruo Out Of Eagles – Uganda Friendly – Royal Times of Nigeria. Super Eagles defender Kenneth Omeruo will play no part in Tuesday’s international friendly match against the Uganda Cranes. 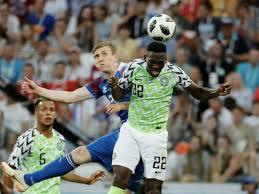 The twenty-five-year-old Leganes, Omeruo defender becomes the third Super Eagles player to have pulled out from the international friendly billed for the Stephen Keshi stadium, Asaba, Delta State. Leon Balogun and Ola Aina are the other two players to have pulled out of the game due to injury. The Leganes defender is expected to fly back to his base in Spain on Wednesday. Ahead of today’s clash, Nigeria and Uganda have met seven times with the Cranes winning four times and drawing once. Nigeria with two wins against Uganda will be hoping to avenge the one-nil home loss suffered in 2015 at the Akwa Ibom International stadium.